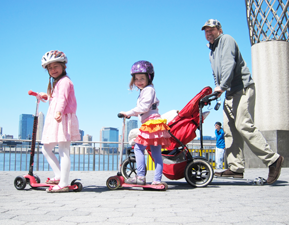 "The origin of the Strooter began with me taking my two small children out for a stroll. I was pushing my son (2) in the stroller with my daughter (4) on her new scooter next to us. What began as a nice walk down the street turned into something much more scary. Before I knew it, my daughter had zoomed off on her scooter and was now completely out of my reach, 50 yards ahead of me up the street! 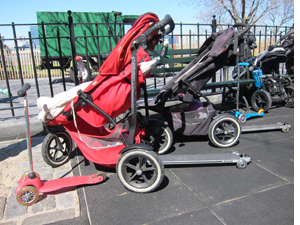 Stuck pushing my son in the stroller, I realized there was no way I could catch up. 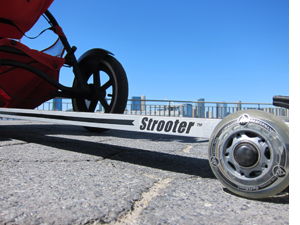 I looked down at the wheels of my stroller and imagined how I‘d be able to quickly catch her if I were on a scooter too. On our way home I saw some wood and brackets from an old IKEA bed-frame discarded on the curb. I ripped them apart as my amazed daughter asked what was I doing! The next morning I jig-sawed the wood, dismantled parts from my old Rollerblades and cobbled them together. The first test version of the Strooter was born! Now some of our best times as a family are spent Strooting through the city together.